Today you may be feeling a little restless about a project that’s in the works but not quite finished. The Seven of Pentacles (Coins, in this deck) refers to the beginning of an idea or a partially finished project that still needs time to mature. 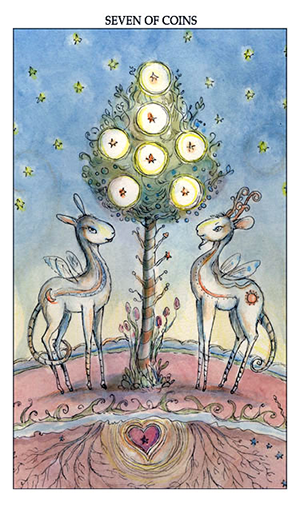 In this version of the card we see two little fairy deer, standing on either side of a tree. A seed has been planted (and nourished with love — as seen in the heart that encapsulates it just below the surface of the earth). They gaze up at their work and coins turning into blooms, a look of sheer wonder on each of their adorable little faces. But the fruit is not quite ready to be picked. It’s not quite “ripe” yet. There may still be work to be done or they may still need to figure out what they’re going to do with the fruits of their labor once it is harvested. Take a moment to reflect on how far you’ve come and give yourself a pat on the back while you’re at it. You can get a sense of not only how much has been done but what’s still left to do to reach your goal. While you still need to think about your next step, you can take pride today in how much you’ve accomplished so far. 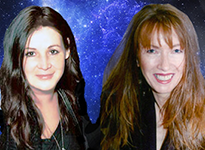 The card used for today’s tarotscope is part of the Joie de Vivre Tarot series by phenomenal artist Paulina Cassidy. You can view and purchase the entire deck on her website or through her Etsy storefront. Please visit and “like” her Facebook fan page!